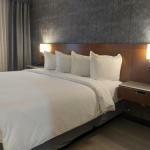 Located near the Indianapolis International Airport and most of the major highways for easy access to downtown Indianapolis, the Adams Mark Indianapolis is a hotel with modern amenities. Dining is available at the Marker Restaurant, which serves American-style breakfast, lunch and dinner, as well as made-to-order pasta dishes from the Pasta Bar for weekday brunch. The hotel is located close to a range of attractions. These include the RCA Dome/Convention Center, Conseco Field House, Circle Centre Mall, Indianapolis City Market, Childrens Museum of Indianapolis, Indianapolis Zoo, Indianapolis Motor Speedway, Indianapolis Museum of Art, White River Gardens, as well as a golf course five miles away. Adams Mark Indianapolis offers 407 deluxe guest rooms and suites that are comfortably furnished with plush top sleep systems. All have remote-controlled television with in-room movies, speed dial telephone with voice mail, work zone with Herman Miller ergonomic desk chair, complimentary high-speed Internet access, iron & board, and wake-up/turn-down service. The attached bathroom has hair dryer. Room service is available during designated hours. Non-smoking rooms, and reduced mobility rooms are available on request. The Business Center offers secretarial and administrative services, as well as rental of audio and visual equipment. There is 35,400 square feet of dedicated exhibition space while the largest meeting room has 9,400 square feet of space. A seasonal outdoor pool and sundeck is good for relaxation, while a fully equipped Fitness Center helps guests maintain their fitness regime. On-site facilities available include safe deposit and security storage, express check-out, same day dry cleaning & laundry, gift shop, and wireless Internet connection in public areas of the hotel.